Over the years when I’ve spoken with many other amateur astronomers about their interest in the sky, most have said that it could be traced back to receiving their first telescope at Christmas. With the winter holidays now behind us, perhaps you fall into this category. If this is the case, then please read this article carefully, for you are now at a very important crossroad. 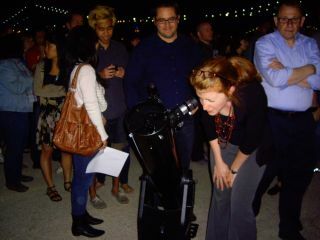 While it is true that many have been hooked on skywatching for life by viewing the wonders of the night sky through their first scope, it is also true that many others have had their initial enthusiasm for astronomy severely dampened by their first telescope — particularly if they didn't know how to properly use it, and any initial pleasure soon turns to frustration. So, now is the appropriate time to talk about how to best take advantage of your new instrument. If you haven't yet opened the box that contains your telescope, good! From 45 years of both personal observing and teaching many others, it’s my belief that you should not hastily rush outside with a telescope before even knowing what's in the sky or what to look at. It's not unlike buying a catamaran if you've never sailed before. When you finally start setting up your telescope, take whatever time is needed to learn its use and operation. Be sure that you have assembled everything with great care. In the beginning, practice how to aim and focus your new instrument, not on the night sky, but on daytime terrestrial objects. Not only are these daytime targets bright and easy to see, but unlike night sky objects, they will not drift out of your field of view because of the rotation of the Earth. So, always remember as a general rule of thumb: the maximum amount of magnification for any telescope is 50-power per inch of aperture. If you have, for example, a 6-inch reflector, 300-power is as high as you should ever attempt to go; the maximum for a 3-inch refractor should be 150-power. True enough. In fact, the aforementioned 500-power is likely achieved by pushing the scope's highest power eyepiece with that very same Barlow lens (a diverging lens named for its creator, the English engineer Peter Barlow), which ultimately will result in a dim, impossibly fuzzy image. If you’re a beginner, you need to understand that using a Barlow lens is similar to enlarging a photograph. The negative — like a telescope's image — contains only so much detail, which can be blown up only so far before all you can see is fuzz! So, if you have purchased a 3-inch telescope — even if it is blessed with perfect optics — the claim of 500-power is more than three times the limit of the most practical magnification that it can provide. Truth be told, you'll probably be surprised to discover that your most pleasing views with your new instrument will come at much lower powers. Low power, in fact, makes a telescope much more convenient to handle, and if your telescope mount or tripod is a bit shaky, as least lower powers will not magnify "the shakes" as much. Personally, I’ve always felt that the most pleasing views with your scope will come at one-half of its maximum possible magnification. So, for that 6-inch telescope, use 150-power, and for a 3-inch telescope, try 75-power. One other thing that should be mentioned is in regard to solar viewing. Some department store telescopes — especially imported varieties — may include a dark glass that is designed to screw into the eyepiece of the scope. Supposedly, this filter is to be used to view the sun. If your telescope came with such a device, discard it immediately! If you do wish to observe the sun, the only way to go is to project its enlarged image onto a white card or screen. On February 26, 2012, the Moon will be close to the planets Venus and Jupiter. So what is there to see? Probably the most rewarding object is the moon. It is bright, easy to locate and filled with fascinating detail. Despite its tremendous brilliance, Venus is a bit of a disappointment right now as it will appear as merely a brilliant blob of light. That will change in the coming weeks as it grows in size and will mimic the changing phases of the moon, appearing half illuminated late in March and then as a thinning crescent during April and May. Jupiter is high and dazzling in the southern sky at nightfall and is unmistakable; its four bright moons are a constantly changing target even in binoculars. Another target is Mars, appearing as a brilliant fiery-colored star in the eastern sky during the mid-to-late evening hours and is now approaching Earth and getting increasingly brighter with each passing night. Rising in the east-southeast sky soon after midnight is the planet Saturn (whose famous rings can be recognized with a magnification as low as 30-power). The brilliant starry scene in the southern sky during the early evening hours contains innumerable treats, including the Pleiades and Hyades Star Clusters and the Great Nebula of Orion. Indeed, there’s an entire universe of stars — double, multiple and all highly beautiful — as well as other nebulas and galaxies for you to explore. The choices are virtually inexhaustible. And as a final piece of advice, make an effort to contact a local astronomy club. You can probably locate the one nearest to you by visiting the website of the Astronomical League (AL) and clicking on "Member Societies." The AL, which is by far the largest national organization of amateur astronomers, is composed of scores of local amateur astronomical clubs and groups, totaling thousands of individuals. By attending local club meetings, you'll get to meet a number of fellow sky gazers who can offer you valuable advice. If you own a telescope, but are experiencing problems with it, there is no better place to go than an astronomy club, whose members can offer assistance and helpful suggestions. Besides, you'll also find camaraderie and the opportunity to spend time with other people from different walks of life who all share the same love for the nighttime sky.